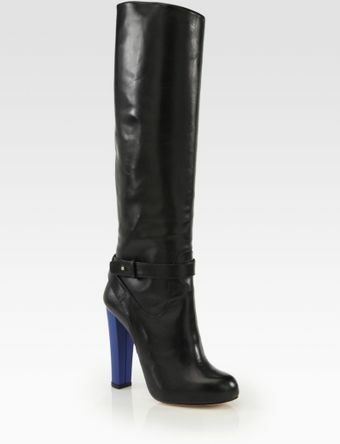 Just when you think you have seen every iteration of a knee high boot, along come these from Aquazzura. I am so in love with the quirky blue heel that I struggle to even find words. The heels themselves are rubber, which again is an unusual twist to a full length leather boot, but again it's a good thing. This makes them interesting and different. It is a feature that I very much approve of. Now I do love black boots, they are a classic, a staple, a must have and a go-to, but just in case you preferred an earthy tone and maybe a different splash of colour then you have no need to fear because Sergio Rossi has well and truly got you covered. 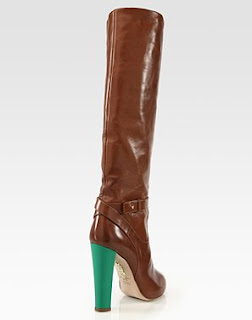 A bright-colored heel revitalizes this classic tall leather silhouette.